Sodick Inc., will be featuring its latest innovative technology in Brooks Associates Booth #1206 at Eastec 2015, including the AG60L Sinker EDM, SL400Q Wire EDM and TT1-400A Electrode Machining Center. The AG60L Sinker EDM features high speed and high acceleration rigid linear motor drives, enabling an even and natural flushing condition that leads to perfect part accuracy. The AG60L can reduce EDMing time by as much as 50%. The menu-driven control automatically writes the NC code for the operator while inserting optimum cutting conditions. With its instantaneous responsive control and no flush technology, the AG60L makes what appears to be impossible, possible. The AG60L comes standard with Sodick’s 10-year positioning accuracy guarantee. The SL400Q raises the bar in Wire EDM technology. The machine features a high quality design, rigid cast construction and a ceramic work-zone. The SL400G includes Sodick’s revolutionary 10-year positioning accuracy guarantee and is rigid linear motor driven. The TT1-400A is a High Speed Electrode Machining Center. It is designed and built for precision graphite and copper electrode productions; designed to achieve maximum speed and acceleration by utilizing the latest in motion control and rigid linear motor drive technology. 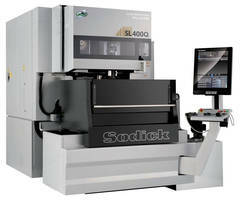 Sodick Inc., established in 1976, has sold over 60,000 EDMs worldwide and has had over 35,000 linear motor EDM deliveries. Sodick machines are used for the production of dies and molds as well as other various applications that cannot be produced by standard machining methods. Sodick has five ISO certified manufacturing facilities with over 3,100 employees worldwide and technical centers located in Illinois, New Jersey and California. Sodick offers the industry’s first 10-year positioning accuracy guarantee on all of its rigid linear motor driven EDM machines.